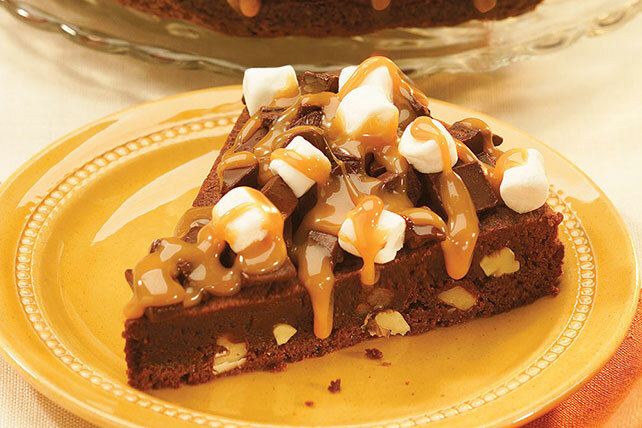 Take the quick route to Rocky Road brownie heaven. Rocky Road Brownies call for a brownie mix with all the fixin's thrown in. It's so easy! Line 13x9-inch pan with foil, with ends of foil extending over sides; spray with cooking spray. Prepare brownie batter and bake in prepared pan as directed on package for cake-like brownies. Sprinkle hot brownie with marshmallows. Cook semi-sweet chocolate and milk in saucepan on low heat until chocolate is completely melted and mixture is well blended, stirring frequently; drizzle over marshmallows. Sprinkle with nuts. Cool completely. Substitute PLANTERS COCKTAIL Peanuts for the walnuts. Spray knife with cooking spray before using to cut the brownies.